To determine the feasibility of a novel intraocular lens (IOL) designed to improve retinal image quality at up to 10° of retinal eccentricity and optionally provide retinal magnification in patients with macular disease. 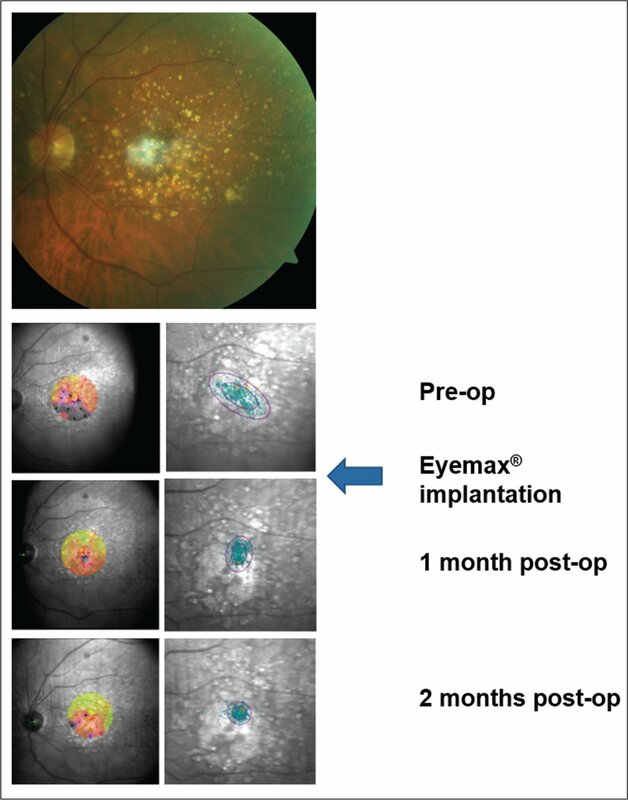 In this prospective, interventional pilot study, 8 eyes of 7 patients with bilateral dry age-related macular degeneration and 1+ or less cataract underwent phacoemulsification and capsular bag implantation of a single, injectable, hydrophobic acrylic IOL. 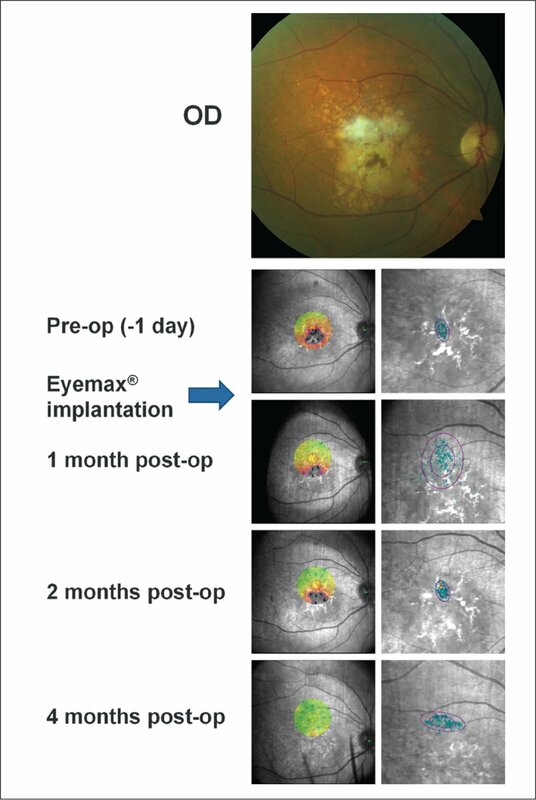 Safety and efficacy were assessed by monitoring logMAR corrected distance and near visual acuity, intraocular pressure, specular microscopy, 80-point visual field testing, and anterior segment and macular optical coherence tomography at baseline and 1 week, 1 month, and 2 months postoperatively. Microperimetry was undertaken at baseline and 1 and/or 2 months postoperatively. Reading performance was assessed at baseline and 1 month postoperatively using the Minnesota low vision reading chart (MNREAD; Precision Vision, LaSalle, IL). Safety outcomes were equivalent to standard monofocal IOLs. Visual acuities improved in all patients. Mean corrected distance visual acuity improved from 0.93 ± 0.22 preoperatively to 0.59 ± 0.25 at 2 months postoperatively. Mean reading speed increased from 28 ± 19 to 44 ± 31 words per minute. Mean microperimetry threshold sensitivities increased from 8.2 ± 4.6 to 12 ± 5.6 dB. Mean percentage of fixation points within a 4° circle increased from 77% ± 17% to 91% ± 11% with evidence for progressive movement of preferred retinal loci away from areas of geographic atrophy. Initial results indicate this novel IOL has a safety profile comparable with standard IOLs. Visual benefits may exceed those obtained with existing technologies in patients with macular disease. Further work is required to determine the full potential of extended macular vision technology. In the decades since intraocular lenses (IOLs) were first introduced, the primary focus has been on optimizing visual outcomes in normally sighted individuals undergoing clear lens extraction and cataract surgery. This has led to the development of injectable soft acrylic IOLs, designed to minimize surgically induced astigmatism, and aspherical lens optics to counter the age-related positive spherical aberration of the cornea.1 Standard soft acrylic IOLs are now capable of delivering a tightly focused image at the fovea and consistent, high-quality visual outcomes in patients with otherwise healthy eyes. However, the quality of the image supplied by such lenses drops off significantly only a few degrees outside of the center of the fovea, and this may have significant implications for visual outcomes in patients with macular disease.2 Patients with macular disease can expect to have a degraded quality of vision with standard IOLs that compounds the poor contrast sensitivity and patchy photo-receptor loss associated with conditions such as age-related macular degeneration (AMD). Furthermore, as conditions such as AMD progress, patients can expect the quality of the images supplied to preferred retinal loci to worsen as more of the macula becomes affected. 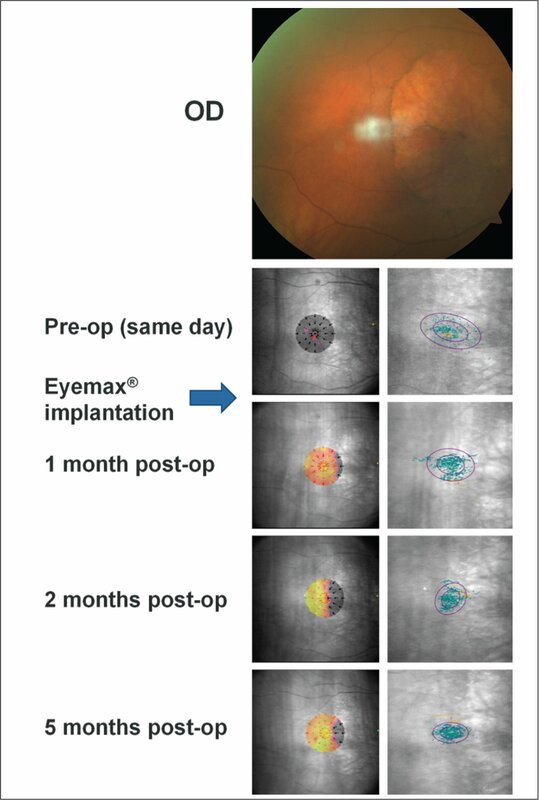 This study was designed to assess safety and initial outcomes following implantation of a novel, single-piece, injectable, soft acrylic IOL for implantation in the capsular bag (Eyemax mono; LEH Pharma, London, United Kingdom). The optics of the Eyemax mono IOL are uniquely configured to supply a focused image to all areas of the macula extending up to 10° from the foveal center in patients with bilateral age-related macular degeneration. Ethics approval was obtained from the London Eye Hospital Ethics Committee for an interventional, non-comparative, prospective, single-center pilot study. The study adhered to the tenets of the Declaration of Helsinki and informed consent was obtained for each patient. Eight eyes of 7 patients with 1+ or less cataract (no Lens Opacities Classification System III [LOCS III] grading parameter > 2), bilateral, advanced geographic atrophy/dry AMD, and preoperative corrected distance visual acuity (CDVA) of 0.60 logMAR or worse underwent lens extraction and IOL implantation with a hypermetropic postoperative refractive target. The amount of targeted postoperative hypermetropia was decided on after careful discussion with the patient regarding the potential benefits of magnification afforded with spectacles using this approach, balanced with the disadvantages of increased glasses dependence for activities of daily living. All patients had moderate-to-severe visual loss in the eye having surgery and so opted to have hypermetropic outcomes of 1.50 to 4.50 diopters (D) depending on individual circumstances (including agreement to proceed with surgery on the second eye if necessary). Valid consent was obtained, with particular attention to the risks of aniseikonia and the possibility of requiring a lens exchange. Initial follow-up visits and assessments were undertaken at baseline and 1 week, 1 month, and 2 months postoperatively. The following investigations were performed at baseline and 1 week, 1 month, and 2 months postoperatively: full subjective refraction, corrected near visual acuity (CNVA) (N-point at 30 cm with logMAR conversion), corrected distance visual acuity (CDVA) (logMAR), intraocular pressure (Goldmann applanation tonometry), specular microscopy (Nidek CEM-530; Nidek Co. Ltd., Gamagori, Japan; 3 acceptable images derived from the central cornea), clinical examination, anterior segment optical coherence tomography (OCT) (Visante; Carl Zeiss Meditec AG, Jena, Germany), and macular OCT (Stratus OCT; Carl Zeiss Meditec). Lenticular opacities were graded according to the LOCS III system. 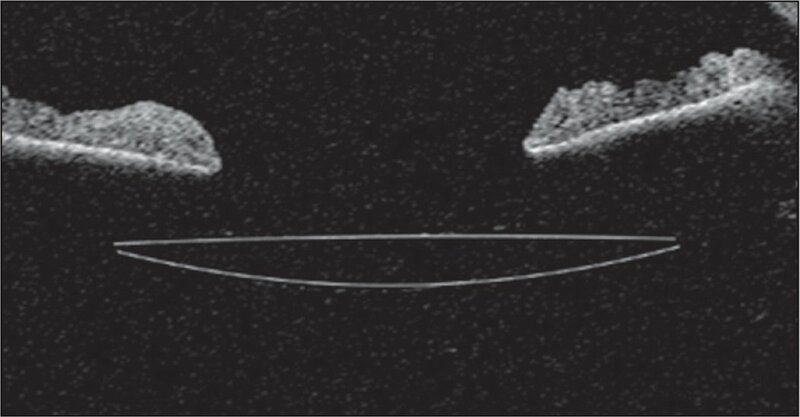 Visual fields were assessed by full-threshold 80-point testing. Reading acuity, critical print size, and reading speed were assessed using the Minnesota low vision reading chart (MNREAD; Precision Vision, LaSalle, IL) after refractive error correction at 1 month postoperatively in the study eye. Microperimetry was performed at baseline and at 1 and/or 2 months postoperatively using the Macular Integrity Assessment (MAIA; Ellex Medical Lasers Ltd., Adelaide, Australia); additional microperimetric assessments were performed 1 to 3 months apart to confirm any changes observed. Microperimetry was undertaken under mesopic conditions with no mydriasis using the “expert” algorithm to assess macular threshold sensitivity and fixation stability (37 points tested in a 10° area centered on the preferred retinal locus; 4–2 strategy; stimulus size Goldmann III with duration of 200 ms). Fixation was permitted to “float” so that the testing area was centered on the preferred retinal locus at each examination. Exclusion criteria included: active choroidal neovascularization (CNV) treated within 6 months of recruitment, axial length greater than 24.5 mm or less than 20.5 mm, uncontrolled glaucoma, and intraocular surgery within 6 months of recruitment. The Eyemax mono (device CE-marked from 2015) is a single-piece, injectable, soft, hydrophobic acrylic IOL designed for siting in the capsular bag. 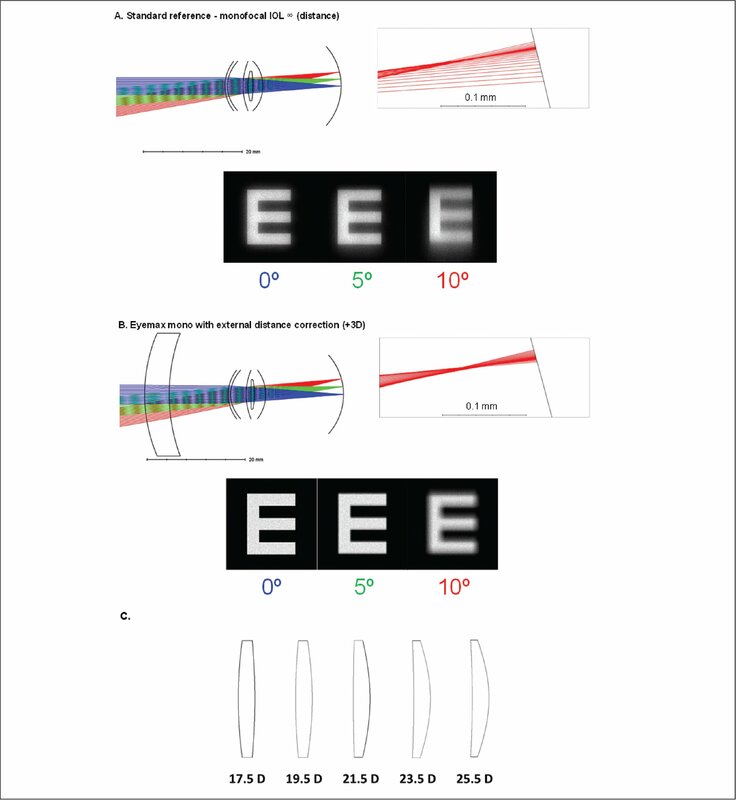 The lens optics are uniquely optimized to provide an enhanced quality of image across all areas of the macula extending 10° from the foveal center and the device therefore constitutes a new class of IOL delivering “extended macular vision,” as first described by Qureshi et al.8 Laboratory simulations indicate that the lens delivers superior image quality compared with standard monofocal IOLs at increasing degrees of retinal eccentricity with potential benefits for patients with macular pathology (Figure A, available in the online version of this article). The IOL may be used to target a hypermetropic postoperative refraction. For example, a target of +2.00 to +3.50 D affords 10% to 20% magnification with glasses, but the degree of hypermetropia may be increased or reduced depending on the severity of the maculopathy and the patient's preference or suitability for this approach. Emmetropia or myopic outcomes may be targeted in individuals with better visual potential or to avoid postoperative anisometropia, as with a standard monofocal IOL. IOL powers were available in dioptric powers of 11.00, 13.00, 15.00, 17.00, 19.00, 21.00, 23.00, and 25.00 D. IOL power was estimated using the SRK/T formula and an A-constant of 119.2. 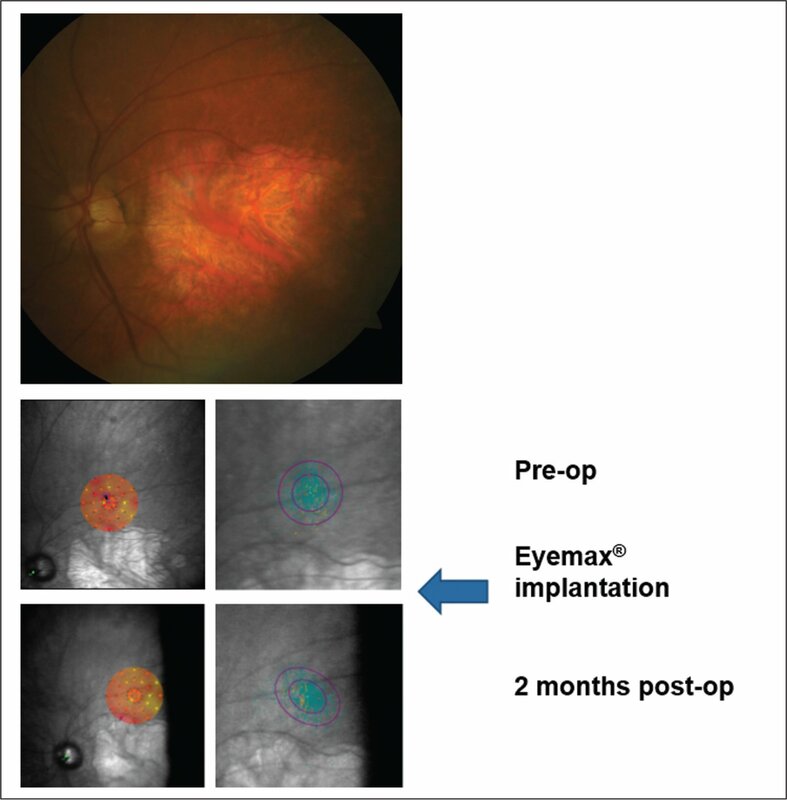 Given the severity of visual loss in the study group, all patients opted for hypermetropic postoperative targets of +1.00 to +4.50 D, following careful counseling about glasses dependence, to maximize postoperative visual function. Surgery was performed by a single surgeon (MAQ) using standard techniques. Topical mydriatic agents were used for pupil dilation and anesthesia was induced by sub-Tenon's delivery. A 5-mm capsulotomy and crystalline lens fragmentation were undertaken using a femtosecond laser surgery platform (LenSx; Alcon Laboratories, Inc., Fort Worth, TX) and lens extraction completed using the WHITESTAR Signature phacoemulsification system (Abbot Medical Optics, Abbott Park, IL) with a standard 2.6-mm corneal incision sited at 100°. The capsular bag was filled with a cohesive ophthalmic viscoelastic device and the lens was then loaded into the injector cartridge, followed by injection into the capsular bag via the main wound, centration of the lens, and ophthalmic viscoelastic device/balanced salt solution exchange. The mean age of patients was 77 ± 16 years (range: 43 to 91 years) and the male:female ratio was 5:3. No intraoperative or postoperative complications were encountered. There were no adverse events and all eyes were observed to gain visual acuity. Baseline characteristics and preoperative and 2-month postoperative visual acuity, corneal endothelial cell densities, and intraocular pressures for each eye are shown in Table 1; cataracts were 1+ or less (LOCS III grading scale). CDVA improved from 0.93 ± 0.22 logMAR preoperatively to 0.59 ± 0.25 log-MAR at 2 months postoperatively (Figure 1A). There was a corresponding increase in mean CNVA (logMAR) from 1.05 ± 0.18 preoperatively to 0.73 ± 0.26 postoperatively (Figure 1B). Conversion for an approximate Early Treatment of Diabetic Retinopathy Study (ETDRS) score gave mean improvements in distance and near distance visual acuity of 18 ETDRS letters. Preoperative and postoperative corrected distance (CDVA) and near (CNVA) visual acuities. All patients were observed to gain visual acuity. (A) Mean CDVA (logMAR) improved from 0.93 ± 0.22 preoperatively to 0.59 ± 0.25 at 2 months postoperatively. (B) There was a corresponding increase in mean CNVA (logMAR) from 1.05 ± 0.18 preoperatively to 0.73 ± 0.26 postoperatively. Conversion for an approximate Early Treatment of Diabetic Retinopathy Study (ETDRS) score gave mean improvements in distance and near distance visual acuity of 18 ETDRS letters. Mean ± standard error of the mean. All patients achieved a postoperative spherical equivalent within 1.00 D of the targeted refraction (mean +2.90 ± 1.30 D; Figure 2). Specular microscopy revealed mean of reductions in endothelial cell counts postoperatively to be 13% ± 14% (range: 0% to 37%). Two eyes had reductions of 37% and 31%; this patient was lost to follow-up after 2 weeks and lack of drop compliance may account for these changes. Results were otherwise in line with reductions expected following standard phacoemulsification cataract surgery (4% to 13%).9 The 80-point visual field testing results were similar preoperatively and postoperatively (50 ± 31 points preoperatively vs 53 ± 27 points postoperatively; Figure 3) and anterior segment and macular OCT imaging revealed well-centered IOLs and stable maculas postoperatively (Figure 4). Intraocular pressures remained stable in all patients postoperatively at 2 months (16 ± 2.8 mm Hg preoperatively and 14 ± 2 mm Hg postoperatively). Targeted and postoperative refractions (spherical equivalent [SE]). All patients achieved a postoperative SE within 1.00 diopter (D) of the targeted refraction (mean: +2.90 D). Full-threshold 81-point visual field test results at baseline and 2 months postoperatively. Results were similar preoperatively and postoperatively. Mean number of points seen was 50 ± 31 preoperatively compared with 53 ± 27 postoperatively. Mean ± standard error of the mean. Representative anterior segment optical coherence tomography image of the Eyemax mono intraocular lens (IOL) (LEH Pharma, London, United Kingdom) postioned in the capsular bag postoperatively. Postoperative MNREAD data were unavailable for one patient. The remainder demonstrated modest improvements in mean reading acuity from 1.07 ± 0.31 to 0.9 ± 0.37 logMAR (Figure 5A) and in critical print size from 1.04 ± 0.25 to 0.95 ± 0.27 logMAR (Figure 5B). Mean reading speed was observed to increase from 28 ± 19 to 44 ± 31 words per minute, an improvement of 57% (Figure 5C). 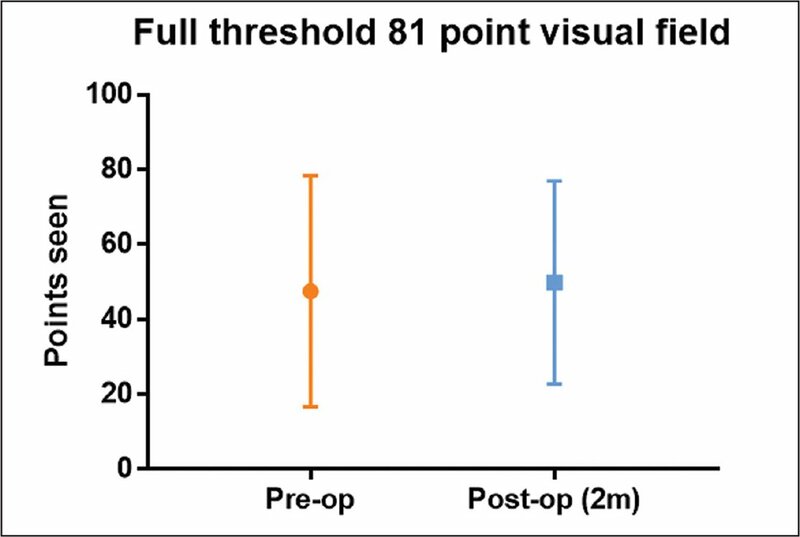 Monocular preoperative and postoperative reading acuity, critical print size, and reading speed. Postoperative Minnesota low vision reading chart (MNREAD; Precision Vision, LaSalle, IL) data were unavailable for one patient. In the remainder, modest improvements were observed in (A) mean reading acuity from 1.07 ± 0.31 to 0.9 ± 0.37 logMAR and (B) critical print size from 1.04 ± 0.25 to 0.95 ± 0.27. (C) Mean reading speed was observed to increase from 28 ± 19 to 44 ± 31 words per minute, an improvement of 57%. Mean ± standard error of the mean. Microperimetry data were obtained at approximately 1 and/or 2 months postoperatively in all but one of the patient eyes. We observed a mean improvement in microperimetry threshold sensitivities from 8.2 ± 4.6 to 12.0 ± 5.6 dB. The mean percentage of fixation points within a 4° circle increased from 77% ± 17% to 91% ± 11%. Although postoperative microperimetry data were unavailable for one patient (eye 5), visual acuities improved significantly in this individual after implantation. Minimal changes on microperimetric testing were observed in 3 eyes postoperatively (eyes 2, 4, and 6; Figures B–D, available in the online version of this article) with evidence of incremental improvements at 1 and 2 months in the remainder (Figures E–G, available in the online version of this article). Preoperative color fundus photograph and microperimetric images obtained at baseline and 2 months after implantation of the Eyemax mono intraocular lens (IOL) (LEH Pharma, London, United Kingdom) (eye 4). Color fundus photograph of the left eye in an 86-year-old man (top panel) confirming a large area of central geographic atrophy and drusen. Left panels show baseline and post-implantation interpolated sensitivity maps demonstrating the sensitivity at each point of the retina using information from nearby stimuli. Right panels show fixation points (blue dots; orange fixation dots represent points used in the first 10 seconds of the test) with bivariate contour ellipse area analysis; the smaller ellipse contains 63% of all fixation points and the larger ellipse contains 95% of all fixation points. Threshold sensitivity at baseline is observed to be reduced (12 dB) and fixation points are spread over a wide area. Threshold sensitivity was observed to have increased slightly at 2 months postoperatively to 12.5 dB; these changes were associated with a slight increase in the quality of fixation (mean percentage of fixation points within a 4° circle increased from 76% at baseline to 84% at 2 months postoperatively. Preoperative color fundus photograph and microperimetric images obtained at baseline and 2 months after implantation of the Eyemax mono intraocular lens (IOL) (LEH Pharma, London, United Kingdom) (eye 3). Color fundus photograph of the right eye in a 76-year-old man (top panel) confirming an area of central geographic atrophy and drusen. Left panels show baseline and post-implantation interpolated sensitivity maps demonstrating the sensitivity at each point of the retina using information from nearby stimuli. Right panels show fixation points (blue dots; orange fixation dots represent points used in the first 10 seconds of the test) with bivariate contour ellipse area analysis; the smaller ellipse contains 63% of all fixation points and the larger ellipse contains 95% of all fixation points. Threshold sensitivity at baseline is observed to be reduced (8.7 dB) and fixation points are spread over a wide area. Threshold sensitivity was observed to have reduced slightly at 2 months postoperatively to 7.4 dB; these changes were associated with maintenance in the quality of fixation (mean percentage of fixation points within a 4° circle 100% at baseline and at 2 months postoperatively). Preoperative color fundus photograph and microperimetric images obtained at baseline and 2 months after implantation of the Eyemax mono intraocular lens (IOL) (LEH Pharma, London, United Kingdom) (eye 6). Color fundus photograph of the right eye in a 91-year-old man (top panel) confirming a large area of geographic atrophy. Left panels show baseline and post-implantation interpolated sensitivity maps demonstrating the sensitivity at each point of the retina using information from nearby stimuli. Right panels show fixation points (blue dots; orange fixation dots represent points used in the first 10 seconds of the test) with bivariate contour ellipse area analysis; the smaller ellipse contains 63% of all fixation points and the larger ellipse contains 95% of all fixation points. Threshold sensitivity at baseline is observed to be reduced (10 dB) and fixation points are spread over a wide area. Threshold sensitivity was observed to have reduced slightly at 2 months postoperatively to 8 dB; these changes were associated with a slight reduction in the quality of fixation (mean percentage of fixation points within a 4° circle decreased from 75% at baseline to 74% at 2 months postoperatively), most likely reflecting variations in test repeatability. Preoperative color fundus photograph and microperimetric images obtained at baseline and 2 and 4 months after implantation of the Eyemax mono intraocular lens (IOL) (LEH Pharma, London, United Kingdom) (eye 7). Color fundus photograph of the left eye in an 84-year-old man (top panel) confirming patchy geographic atrophy and associated drusen. Left panels show baseline and post-implantation interpolated sensitivity maps demonstrating the sensitivity at each point of the retina using information from nearby stimuli. Right panels show fixation points (blue dots; orange fixation dots represent points used in the first 10 seconds of the test) with bivariate contour ellipse area analysis; the smaller ellipse contains 63% of all fixation points and the larger ellipse contains 95% of all fixation points. Threshold sensitivity at baseline is observed to be reduced (9.5 dB) and fixation points are spread over a wide area. Threshold sensitivities were observed to have increased at 1 and 2 months postoperatively (average threshold sensitivities 15.4 and 17.1 dB, respectively); these changes are associated with a progressively more tightly focused cluster of fixation points centered outside of the area of geographic atrophy (mean percentage of fixation points within a 4° circle increased from 66% at baseline to 97% at 1 month and 98% at 2 months postoperatively). Preoperative color fundus photograph and microperimetric images obtained at baseline and 1, 2, and 3 months after implantation of the Eyemax mono intraocular lens (IOL) (LEH Pharma, London, United Kingdom) (eye 1). Color fundus photograph of the right eye in an 86-year-old woman (top panel) confirming a large area of geographic atrophy. Left panels show baseline and post-implantation interpolated sensitivity maps demonstrating the sensitivity at each point of the retina using information from nearby stimuli. Right panels show fixation points (blue dots; orange fixation dots represent points used in the first 10 seconds of the test) with bivariate contour ellipse area analysis; the smaller ellipse contains 63% of all fixation points and the larger ellipse contains 95% of all fixation points. Threshold sensitivity at baseline is observed to be zero with no stimuli seen (black dots) and fixation points are spread over a wide area that straddles the temporal border of geographic atrophy. Threshold sensitivities were observed to increase progressively over a 5-month period postoperatively (average threshold sensitivity increased from 0 dB at baseline to 16.6 dB at 5 months postoperatively); these changes are associated with a progressively more tightly focused cluster of fixation points centered outside of the area of geographic atrophy (mean percentage of fixation points within a 4° circle increased from 64% at baseline to 94% at 5 months). The preferred retinal locus is located temporal to the area of geographic atrophy in the patient's right eye and nasal to the area of geographic atrophy in the left eye (see Figure FB); this configuration is generally adopted to facilitate reading. 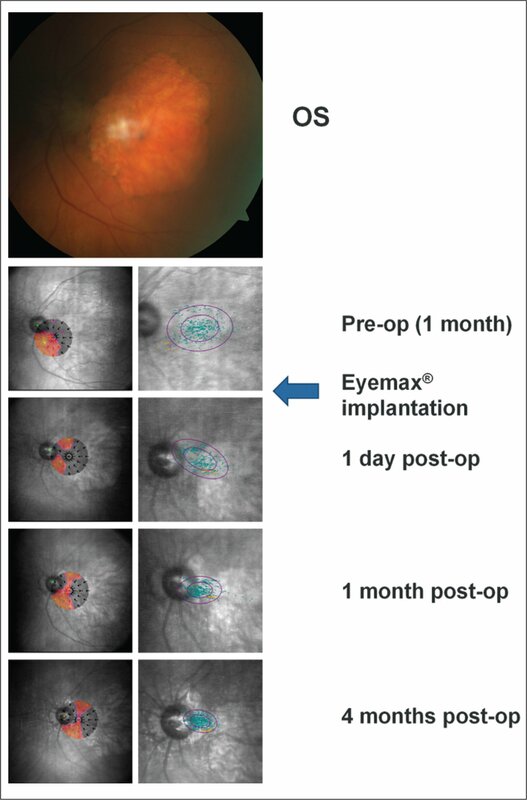 Preoperative color fundus photograph and microperimetric images obtained at baseline and 1 day, 1 month, and 4 months after implantation of the Eyemax mono intraocular lens (IOL) (LEH Pharma, London, United Kingdom) (eye 8). Color fundus photograph of the left eye in an 86-year-old woman (top panel; right eye is shown in Figure FA) confirming a large area of geographic atrophy and minimal cataract. Left panels show interpolated sensitivity maps demonstrating the sensitivity at each point of the retina using information from nearby stimuli at baseline and post-implantantion. Right panels show fixation points (blue dots; orange fixation dots represent points used in the first 10 seconds of the test) with bivariate contour ellipse area analysis; the smaller ellipse contains 63% of all fixation points and the larger ellipse contains 95% of all fixation points. Threshold sensitivity at baseline is close to zero, with only a few stimuli seen in an area inferotemporal to the disc, and fixation points are spread over a wide area centered within the area of geographic atrophy. Threshold sensitivities remained largely unchanged postoperatively but fixation shifted so that the preferred retinal locus exploited a narrow corridor of functioning photoreceptors between the optic disc and the area of geographic atrophy. These changes were associated with a progressively more tightly focused cluster of fixation points centered outside of the area of geographic atrophy (mean percentage of fixation points within a 4° circle increased from 57% at baseline to 93% at 4 months postoperatively). Preoperative color fundus photograph and microperimetric images obtained at baseline and 1, 2, and 4 months after implantation of the Eyemax mono intraocular lens (IOL) (LEH Pharma, London, United Kingdom) (eye 2). Color fundus photograph of the right eye in a 65-year-old woman (top panel) confirming a large disciform scar with soft drusen superiorly and minimal cataract. Left panels show interpolated sensitivity maps at baseline and post-implantation demonstrating the sensitivity at each point of the retina using information from nearby stimuli. Right panels show fixation points (blue dots; orange fixation dots represent points used in the first 10 seconds of the test) and bivariate contour ellipse area analysis; the smaller ellipse contains 63% of all fixation points and the larger ellipse contains 95% of all fixation points. At baseline, the sensitivity map shows a large central scotoma, as indicated by unseen stimuli (black dots), and an area of better sensitivity at the superior border of the scar. The adjacent baseline fixation plot shows fixation is tightly centered within the disciform scar. At 2 months postoperatively, the central scotoma is beginning to shift outside of the sensitivity map as the center of fixation moves superiorly. At 2 months postoperatively, threshold sensitivity is observed to increase and fixation becomes more tightly focused at the superior border of the disciform scar. At 4 months postoperatively, unseen stimuli are completely absent from the sensitivity map as the preferred retinal locus shifts to take advantage of healthier retina superior to the disciform scar with resulting improvement in average threshold sensitivity (from 12.9 dB at baseline to 27 dB at 4 months postoperatively). Stimuli are located 2.5° apart, thereby permitting, with reference to retinal landmarks, an estimate of the how far the preferred retinal locus has moved from baseline, approximately 8°. The fixation plot confirms a redistribution of fixation points to the superior retina well away from the disciform scar. We were able to undertake further microperimetry testing for three of the study eyes and these data indicated incremental improvements in visual function beyond the 2-month time-point. Preferred retinal loci in these eyes were observed to shift progressively away from areas of geographic atrophy. In eye 1, the average threshold sensitivity increased from 0 to 16.6 dB at 5 months postoperatively with an associated increase in the mean percentage of fixation points within a 4° circle from 64% to 94% (Figure FA). For this patient's second eye (eye number 8), testing at 4 months postoperatively indicated a slight reduction in average threshold sensitivity from 4.2 to 3 dB but an increase in the mean percentage of fixation points within a 4° circle from 57% to 93%; these points were concentrated in a narrow corridor between the optic disc and a large area of geographic atrophy (Figure FB). 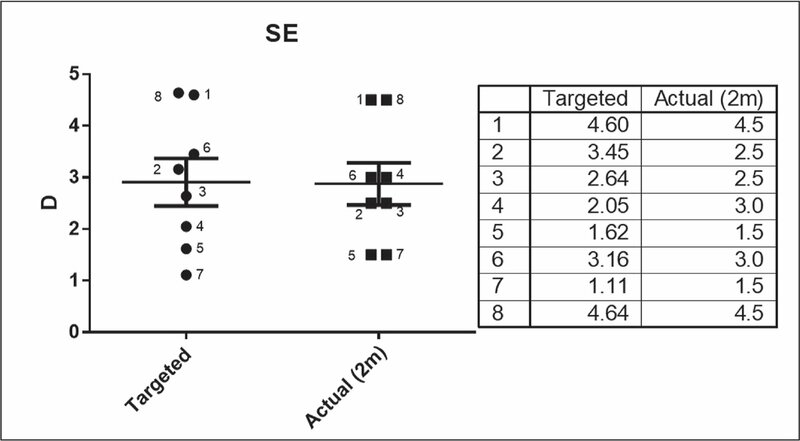 Testing in a third patient (eye 2) at 4 months postoperatively showed an increase in threshold sensitivity from 12.9 to 27 dB and a slight decrease in the mean percentage of fixation points within a 4° circle from 99% to 83% (Figure G). No symptoms of aniseikonia, diplopia, or dysphotopsia were reported and all patients later went on to have the device implanted in their other eye. Eyes with AMD have poor contrast sensitivity and scotomata (often involving the center), making the quality of the image provided by an IOL absolutely critical to successful visual rehabilitation. To date, surgeons have used standard monofocal IOLs to target emmetropia and tightly focus the image at the foveal center in such patients; however, the quality of the image supplied by standard IOLs drops off rapidly at only 4°1–2 of retinal eccentricity (approximately 1.15 mm), despite cone density still being relatively high, at approximately 20,000/mm2, in this area.2,14 By supplying a high-quality image out to 10° of retinal eccentricity, the Eyemax IOL theoretically optimizes visual potential in macular disease and protects against progressive visual loss. Other devices either provide magnification alone or combine this with the ability to target a patient's preferred retinal locus, but this comes at the cost of inferior optics and has the potential to disrupt a patient's natural coping strategy, one that may involve the use of multiple preferred retinal loci for activities of daily living or an increased dependence on the peripheral visual field. Although there is no evidence for the benefits of magnification that might be associated with deliberately targeted hypermetropic outcomes, we estimate that a target of +2.00 to +3.50 D affords 10% to 20% magnification with glasses and patients were counseled regarding this option, particularly given the severity of AMD in the cohort; all opted for a degree of targeted hypermetropia (the amount varying depending on the preoperative refraction and whether surgery was planned on the second eye), although this is not essential to the principle mechanism of visual benefit with the device. Fixation instability is known to contribute to reduced reading rates in patients with macular scotomata and probably arises from a tendency to adopt a preferred retinal locus at the border of an area of atrophy.19 We excluded patients with significant cataract because this has also been noted to affect macular sensitivity and fixation stability; the mean macular sensitivity of our cohort preoperatively (8.3 dB) was greatly reduced compared with data obtained from similarly aged patients with healthy maculas (14.7 to 15.5 dB), as would be expected for patients with this severity of AMD.20 We observed a gradual shift in the preferred retinal locus away from the border of geographic atrophy in three patients after implantation over a 4- to 5-month period. The process by which patients select preferred retinal loci remains unclear, but patients with CNV tend to establish a repeatable preferred retinal locus within 6 months of developing a scotoma.21,22 Recent evidence suggests that the mechanism of preferred retinal locus selection is complex but that patients tend to select an area in the left and/or inferior visual field that is not necessarily in the retinal location with the greatest microperimetric sensitivity (leading to the suggestion that contrast sensitivity at the preferred retinal locus might be improved by directing fixation to a more eccentric location as observed in Stargardt disease).23 Although we cannot exclude the possibility of a learning effect associated with microperimetry testing or an effect from removal of mild lenticular opacity, this is unlikely to be sustained over 3 to 4 months between tests. Levels of test repeatability have been found to be high in patients with central field loss and neither extrafoveal fixation nor fixation stability appear to affect test–retest variability at specific loci in the absence of any intervention.24,25 Retesting at specific retinal locations was not undertaken as part of the current study to determine whether the extended macular vision IOL ultimately permitted the adoption of a more favorable preferred retinal locus. Further work is needed to compare the microperimetric outcomes with those following standard cataract surgery. 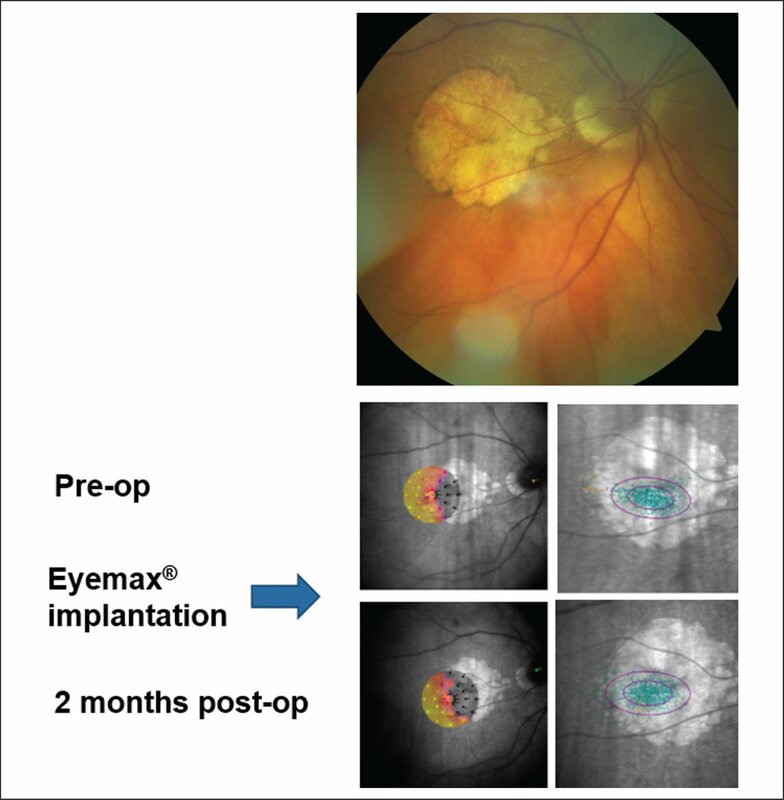 In a recently published consecutive case series of 244 eyes with dry/stable wet AMD and visual acuity of 0.3 logMAR or worse, implanted with the Eyemax mono IOL, no eyes had worsening of CDVA, mean postoperative refractive outcomes were within ±1.00 D of the target refraction in 88% of cases, and mean pre-operative CDVA improved from 1.06 to 0.71 logMAR postoperatively (equating to an approximate ETDRS gain of 18 letters), with mean postoperative reduction in endothelial cell density of 7%.8 Similar benefits were observed with a version of the device designed for eyes previously implanted with a standard mono-focal IOL, removing the effects of cataract removal as a confounding factor.26 Further research is necessary to determine the potential benefits of extended macular vision technology and whether visual function is maintained for longer in patients implanted with this device compared with other intraocular telescopes and standard IOLs. 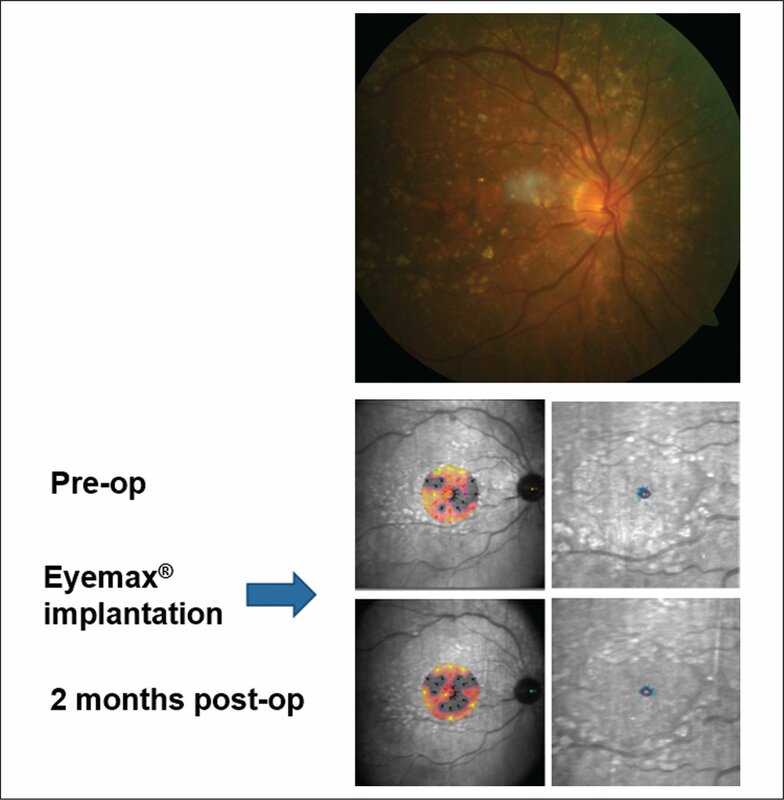 The benefits of bilateral implantation have yet to be explored but are likely to be summative, as occurs following bilateral implantation with standard IOLs.18 Further work is also required to determine whether patients with other forms of maculopathy, such as those with macular holes and cone dystrophies, might benefit. Initial results are promising and indicate that this novel extended macular vision device has a safety profile comparable with that of standard IOLs and may offer significant advantages over existing technology in the management of macular disease. Hwang HB, Lyu B, Yim HB, Lee NY. Endothelial cell loss after phacoemulsification according to different anterior chamber depths. J Ophthalmol. 2015;2015:210716. Hengerer FH, Auffarth GU, Robbie SJ, Yildirim TM, Conrad-Hengerer I. First results of a new hyperaspheric add-on intraocular lens approach implanted in pseudophakic patients with age-related macular degeneration [published online ahead of press March 2018]. Ophthalmol Retin. doi:10.1016/j.oret.2018.02.003 [CrossRef]. From London Eye Hospital, London, United Kingdom (SJR, MAQ); Vision and Eye Research Unit, Anglia Ruskin University, Cambridge, United Kingdom (JT); and Laboratario de Optica, Universidad de Murcia, Murcia, Spain (JT, PA). The authors have a patent for the Intraocular Lens System pending.